In this entry I’d like to introduce a Native American mtDNA tool to help people better understand Native American genetics. This tool is a compilation of the all of the Native American mtDNA research studies currently available (as of 2016). As more studies are published, the data in the chart below will be updated. Links to the complete studies can be found at the end of the entry. mtDNA is mitochrondial dna that is passed down from mothers to offspring during sexual reproduction. Both male and female offspring possess mtDNA. Y chromosomal data is passed down only to male offspring from fathers during sexual reproduction. A haplogroup is defined by the differences in human mitochondrial dna. The different haplogroups are named with a single letter running from A-Z. 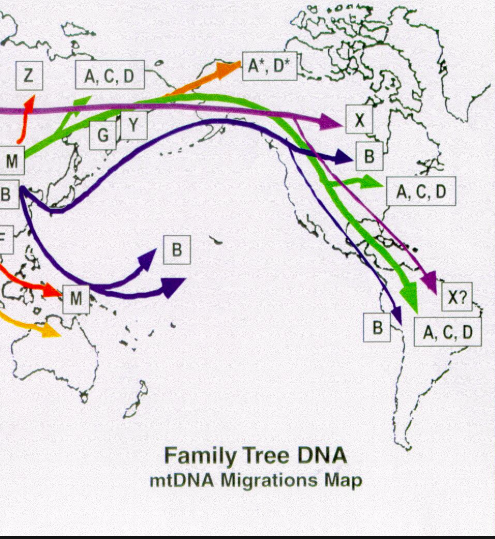 These differences in mtDNA haplogroups are caused by random genetic mutations that occur over time. Because these genetic mutations are passed down to offspring, it is possible to link particular haplogroups with geographical locations. It can be said then that all people who possess an ‘A’ mtDNA haplogroup are related to each other and their lineage can be traced back to the one person who first exhibited that particular genetic mutation. What are the Native American MTdna haplogroups? This tool can help to show the patterns of distribution of Native Americans across the Americas. Generally speaking, the higher the percentage of a particular haplogroup in a particular population, the lower the genetic diversity. This could mean for example that the population arrived recently from elsewhere and did not reproduce often with Native Americans of other haplogroups or that the group was historically isolated. This tool can also be helpful in narrowing down one’s ancestry. For example, if a person’s family has lived in an area of the Southwest where both Uto-Aztecan (Hopi, Tarascan, Yaqui) people and Athapaskan (Apache, Navajo) people lived, their MTdna could help to narrow down ancestry. If the person possesses a C MTdna haplogroup, the probability that the person descends from the Uto-Aztecan lineage is greatly heightened. If there is a rumor in the family that there are Inuit grandparents and the person possesses an A mtdna haplogroup, the validity of the rumor is greatly increases because the Inuit have a very homogenous mtdna haplogroup. To acquire your mtDNA you’ll need to purchase either an mtDNA test or an autosomal test. If you order an autosomal test (the one where you are only given your ethnic percentages), you’ll need to follow the instructions found at this link to convert your autosomal raw data to your mtDNA haplogroup. Companies that offer both tests include National Genographic, Ancestry DNA, and 23 and Me. Overall, Native Americans have low genetic diversity when compared to people from other places in the world. This is the result of a small number of MTdna haplogroups in the gene pool. This means that Native Americans have been relatively isolated from people in other parts of the world. Some Native American groups such as the Nahua exhibit a high level of diversity relative to other Native Americans groups. Other Native American groups such as the Navajo, Apache and Zuni exhibit a low level of diversity relative to other Native American groups. An example of high diversity might look like this: A – 33.3%, B – 33.3%, C-33.3%, D-0% whereas an example of low diversity might look like this: A – 95%, B – 2%, C-0%, D – 3%. Studies vary in the number of participants represented in the data. When looking through the data, be careful to note the # of participants as this affects the reliability of the data. For example, if one study showed 100% of the participants possessed a Native American haplogroup but there were only three people in the study, this is not a very reliable data source and you would need to look for other studies with more participants with that group or look at the patterns in related groups with higher numbers of participants. The higher the number of participants, the more reliable the data. In many cases, the haplogroup studies support Native American oral and historical accounts. We know for example from Native sources that the Navajo and Apache people arrived to the Southwest very recently and did not maintain friendly relations with the people already living there. 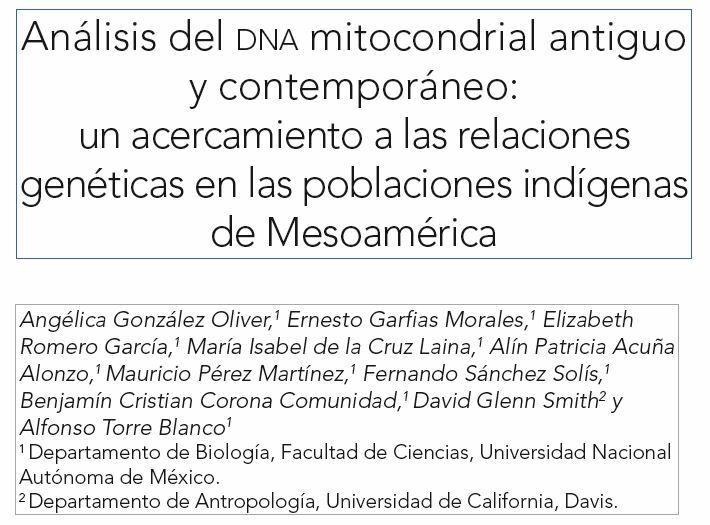 This is supported in the research as Navajos and Apaches in the study tend to have very low genetic diversities (predominately A). The Zuni language is an isolate and is not related to any other Native American language. Genetically, they also possess low diversity which supports the idea that the Zuni did not have substantial contact with other groups. There are many historical sources that detail the journey of the Aztecs from Aztlan to Mexico-Tenochtitlan. Linguistically, the Azteca/Mexica belong to the Uto-Aztecan family and most members of the Uto-Aztecan family live in the U.S. Southwest/Northern Mexico. Nahuas today show a high level of genetic diversity which shows 1. their dna is now very different from their Uto-Aztecan relatives and 2. their stories about reproducing with people living in Mexico such as the Tolteca are reflected in their genetics. Location – The geographic location of the Native American group. In some cases, if the geographic location is not specified, the language family is present instead. Participants – The number of people from that Native American group whose dna was tested and included in the study. A, B, C, D – The percent of the participants in the study who possess that particular haplogroup.